SWISS CHARD-BLITVA, DETOX MEAL VERSUS TRADITIONAL MEAL? Let’s start this new year with a simple detox meal. Swiss chard is known to be low in calories, rich in antioxidants, vitamins and minerals. It aids the digestion and fortifies your immune system. It is, also, quite low in cholesterol and cleanses your body inside out. Swiss chard is Mediterranean plant and here in Dalmatia it is available fresh throughout the whole year on the farmers’ markets. We can say that it is the Dalmatia’s most popular vegetable. Traditionally it is cooked with tiny chopped potatoes, with added olive oil and garlic that accentuetas its specific bitter taste. In that combination, swiss chard is served also as a main dish, as a side dish together with grilled fish (one of the most “typical” combinations in Dalmatian cuisine), a side dish together with meat or even as a soup. 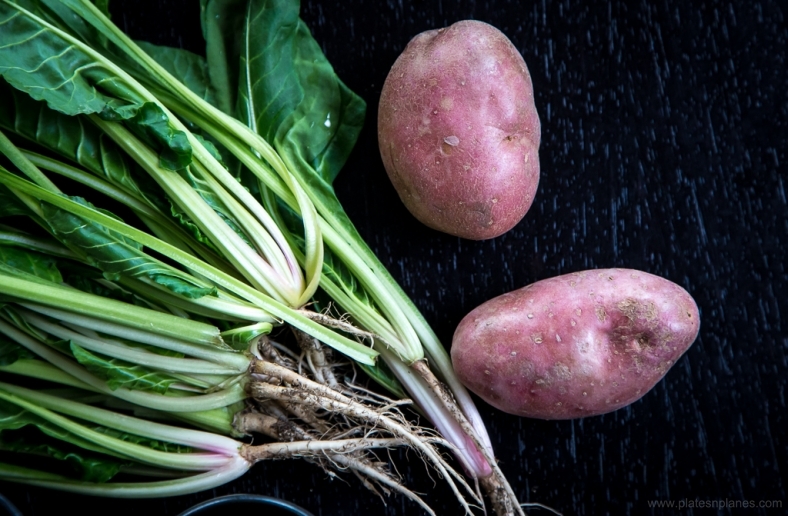 However, now we will mainly focus how to prepare swiss chard as a detox meal after the period of indulging in all the holidays’ treats and also learn how to prepare it the traditional way together with potatoes. Everyone believes they know how to prepare it, but rare ones know how to prepare it correctly. The preparation by itself is simple, easy and not time-consuming, but it is extremely important to be very exact and precise in order to protect the nutritional value of this amazing vegetable. Put 2-3L of water in a big pan, leave until it starts boiling. In the meantime, wash well swiss chard, twitch it into pieces and cut the stems. Put the vegetable in the boiling water and cook uncovered (important!) for just 3 minutes. Strain it well and press it with a fork to make sure all excess water is out. 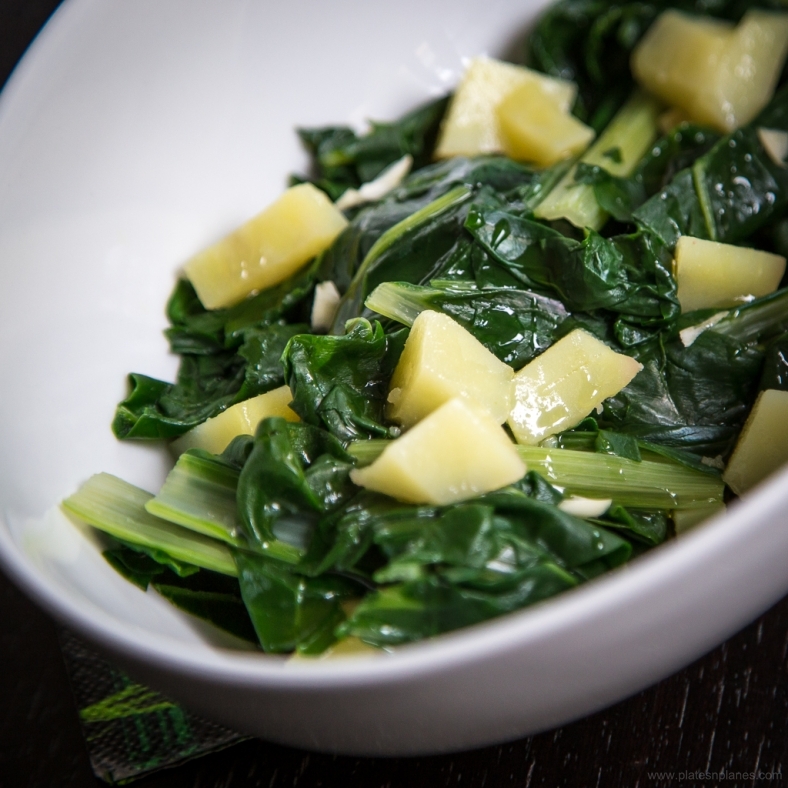 Put the cooked swiss chard into a glass bowl and add the mixture of olive oil and garlic. And voilá – only 10 minutes and our detox meal is ready! Garlic is also known to aid the digestion, to help the kidneys and liver to work effficiently and to lower “the bad” cholesterol. Olive oil helps the digestion and it is an amazing anti-age ingredient. Add the potatoes in salted, boiling water and cook for 10-15 minutes. Make sure not to overcook. Check the potatoes near the end of cooking time, add the swiss chard and continue to cook for 3 more minutes. Strain it and press it with a fork to get rid of excess water. Add the mixture of olive oil and garlic. And… that’s it! The most popular Dalmatian vegetable is ready to be enjoyed! Bon appétit!